This page is designed with the beginner in mind or those of you who would like to turn up their knowledge base. 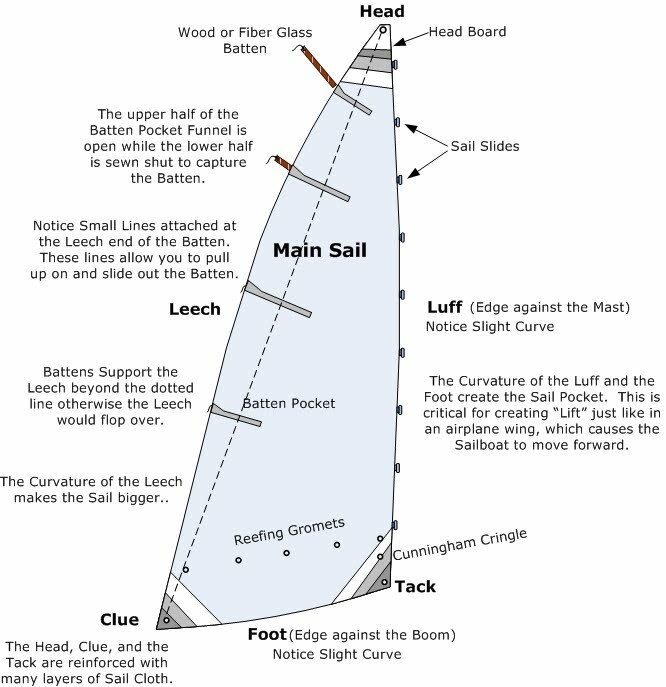 Here you will learn about the parts of a sail, the standing rigging and the running rigging. Sailing like any sport or hobbie has it's own special language, concepts, and terminology. This set of mini-courses should help your build that knowledge base or tune up the one you already have. Understanding what is being said makes it more fun and could save your life. You are about to learn some basic terminology that will, hopefully, start you down the adventure of a lifetime. But always keep in mind that if you are at this page then your job on a sailboat is to heed the captain and mind your manners. Never be ashamed to say you don't understand what is being asked of you. In fact always inform the Skipper of the level of your sailing abilities. Sailing is a fun sport but it is also a dangerous one, particularly if you do not know what you are doing. Oh! And one more thing for you beginners...it's call a BOOM for a reason!!! Mind ye'r head!!! The main sail is the primary propulsion for a sailboat. It is an expensive machine. The standard mains'l for a Catalina 22 costs between $600 and $700. Follow these links to learn more about the Cunningham, Cunningham Cringle, the Out Haul attached to the Clue, and battens. The standing rigging is the hardware that holds the mast in place. There are two support cables know as stays. The fore stay and the aft stay keep the Mast from moving foreward or aft. There are six cables know as shrouds. There are two upper shrouds that extend outward to the ends of the spreaders, two foreward lower shrouds, and two aft lower shrouds. The six shrouds have about 18 inches of protective tubing at the deck end called Shroud Tubes. The Shroud Tubes prevent the Heads'ls from being chaffed by the Shrouds. Each shroud and stay terminates in a turnbuckle at the deck end. The turnbuckles allow the cable to be tensioned to the proper amount to keep the mast upright, steady, and properly shaped. A Tension Gauge is used to properly tension the Stays and Shrouds. The Running Rigging consists of any lines whose job it is to control parts of the Sail Boat while underway. The Jib and Main Halyards raise and lower the Heads'l and the Mains'l. On the Christopher-Jin these lines are run to the cockpit. This makes it easy to raise and lower the sails, otherwise you would have to climb on the cabin top to work these lines. The Jib and Main Sheets control the position of the sails. The Topping Lift controls the height of the boom when the Main Halyard has not completely raised the Main. The Keel cable is connected to a wench in the cabin and controls the depth of the Swing Keel. Normally the keel is in the fully down position unless you are in particularly shallow waters. 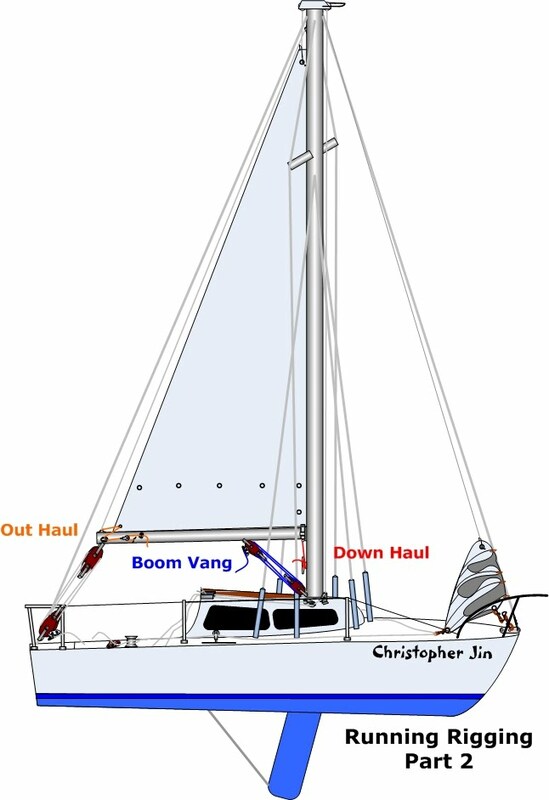 Every sailboat has an Out Haul and a Down Haul. The Out Haul can be simply a single line the pulls the foot of the sail toward the free end of the boom or the Out Haul can consist of an elaborate arrangement of blocks. The Down Haul consists of a line attached to the mast end of the boom. Its job is to set the maximum height of the Tack of the Main Sail. Without the Down Haul the Main Halyard would pull the boom upward until it came out of its track. The Boom Vang consists of an arrangement of Fiddle Blocks such that it works to prevent the free end of the boom from raising higher and higher as the strength of the wind increases and thus destroying the shape of the Main. Go to Project Gallery to see how you can build some of items show on this page.